In my former professional life, I used to do a lot of .Net development, mostly ASP.Net development focussed on whatever alternative to WebForms was available at that time – e.g. ASP.Net MVP (remember that? ), ASP.Net MVC, ASP.Net Web Pages. 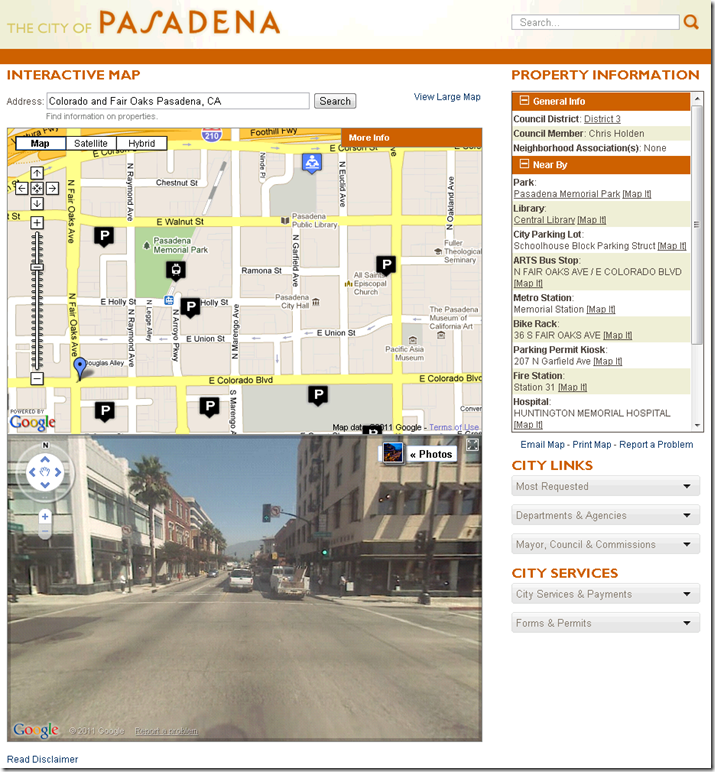 The enhancements that I’ve been making to the interactive map on The City of Pasadena’s web site went live yesterday! The Google Maps based interactive map was originally developed (by another consulting firm) to help residents identify what neighborhood and city council districts they lived in. A user entered an address, and the page would display a marker on the map with an info window listing the location’s city and neighborhood council districts. Below the map the page would show a street view panorama of the location. The user also had the option of viewing the city council district boundaries on the the map as KML overlays. The City wanted to enhance the page by also displaying nearby features (such as libraries, transit stations, etc.) on both the map and the list. I know that in MVC, controlling access to controller actions (and thereby the associated views) is done via a specific type of ActionFilter called an AuthorizationFilter. Also, the ASP.Net MVC Web Application template includes code that shows how to use an ASP.Net membership provider to enable user registration and login. So, a quick test that will tell me if the built-in AuthorizationFilter will be able to meet the first 2 functional specifications above is to add an authorization filter to the Add action of the Workouts controller so that only users that have logged in will be able to add a workout. Now when trying to add a workout, a user is redirected to the login page. After registering and logging in the user is now able to add workouts! In the next installment I will try to convince myself that I can control access to actions based on user’s relationship to an entity (i.e. members can only delete their own workouts). The site will allow anyone (both anonymous and logged in users) to view all recently logged workouts. The site will allow users to create an account and thereby become members. Members will be able to log their own workouts. Members will be able to add events that they are training for. Members will also be able to join one or more teams. A team is a group of members (e.g. that may train together or who are training for the same event). Teammates will be able to subscribe to updates (i.e. via a feed, e-mail alerts, or iCal) to the logs of their teammates. Only certain members will be able to create, own, and manage a team. I’m sure these and other stories will get more flushed out as the project evolves, but that’s plenty for now. That all looks like pretty vanilla stuff for a WebForms application, but I’ll have to convince myself that it will all work out in the MVC world. So it’s time to write some proof of concept code to convince myself I won’t get stuck. My client wanted a list of all of the tables and their respective columns in a given SQL server database. My first instinct was to get Visio to create an ER diagram by reverse engineering the database. However, with dozens of tables in this database, the diagram that Visio spit out looked like spaghetti and meatballs, and would have printed across 36 8.5″x11″ pages. That said, Visio did a better job laying out the diagram than I would have by hand. Download the template file (all_table_columns.tt). Copy it to any Visual Studio 2005/2008 project. Open it, replace “[your connection string here]” with a valid SQL Server connection string (ideally to a database with a limited number of tables), and then save the file. Visual Studio attempts to generate the output whenever you save the template file, so the new text file should already be generated. To view it, go to the Solution Explorer window and expand the node for all_table_columns.tt and you will see a file named all_table_columns.txt. Open that text document and you should have a list of all tables and columns! For more on code generation via T4, see Scott Hanselman’s link-fest of a post. So, if you read my first post in this series, you know I’m creating a MVC web application to log and share workouts. Picking up where I left off, I’ve got to complete the life cycle of a workout (insert, select, update, and delete). In the first post we covered adding a new workout, and selecting recent workouts. That leaves updating and deleting workouts. To save time we’ll just implement the delete functionality and leave updating for later. To enable deleting all I had to do was add a controller action that would perform the delete operation against the database and add forms to the default view that would post to this controller action. Note that the action only accepts HTTP POST requests and that it expects the MVC framework to map an input value to a local integer variable called workoutId which it then uses to query and delete the workout record in the database. Wow, that was easy and I was able to implement it in about a dozen lines of code or so. I <3 MVC. In my next iteration, I’ll create some user stories to see what direction I need to go from here. I know, I know, this is a little backwards. I probably should have started with pen and paper (and what of unit tests???) and then gotten into the code, but MVC is new to me, and I needed to write some code just to understand the life cycle of a page. Besides, better late than never, right? I’ve been very excited about ASP.Net MVC ever since I started hearing about its emergence in various blogs and podcasts. MVC basically addresses all of the issues I have with developing ASP.Net web sites (viewstate, postbacks, testing, etc), and I’ve eagerly awaiting a release its release. To do create this application on my dev machine, I would need to install ASP.Net MCV Beta (as well as VS 2008 SP1). By coincidence (I swear) Stephen Walther and Paul Litwin create a workout log application in their ASP.Net MVC video series. As a first iteration, I thought it would be a good idea to basically go through this series step by step and publish the output on my new hosted. After walking through the steps in the videos, I modified the pages slightly to use the site’s master page, which I also modified a bit to handle navigation for the newly added pages. You can see the results at: http://myjoglog.net. Creating an app that adds and displays data in just a couple of hours (thanks to the help of the template code and tutorials) isn’t too shabby, but there’s lot’s of work to be done. For starters, I want to be able to complete the life cycle of a workout (insert, select, update, and delete). So I’ll do that next. After that it’s time to take a step back, and review the user stories to get a firm idea of what the app will need to be able to do – this is where my path will diverge from the good start set out by Walther and Litwin. With the big picture in mind, I’ll be able to layout the subsequent iterations that will allow me to get the app fully functional in time to help my brother-in-law train for his marathon. Since all the .Net applications I am currently working on use Oracle on the back end, I haven’t spent a lot of time looking into LINQ – LINQ to SQL only supports SQL Server. After attending the 2008 launch event and getting a chance to put my hands on some LINQ examples in the labs I didn’t get the feeling that I was missing much. I currently use SubSonic as a means of automating the creation of an abstraction layer between my UI code and the database, and I love it. I’ve been considering it a bridge that will last me at least until LINQ to Entities comes out later this year, at which point I’ll have to evaluate the pros and cons of each. Scott Hanselman’s recent interview with Mike Pizzo provides a great in-depth analysis of the differences between LINQ to Entities and LINQ to SQL. As with any abstraction layer, performance seems to be the question on everyone’s mind. It would be great to see benchmarks of the same queries of the same database for both Linq to SQL and Linq to Entities. Which brings me to my point, I would love to see a Linq to Oracle. I’m sure Oracle is on board to create a provider for the Entity Framework, and I know the EF provides added value (mapping entities to multiple tables, and vice versa), but I would also like to see Oracle provide an implementation of the IQueryable interface that is lean and mean for simple applications. In the mean time, I think I’ll check out the DbLinq Project, which claims to provide LINQ implementations for databases other than SQL Server. I was going to look into this when I first started using SubSonic, but I saw the Nov 07 update that said the Oracle Provider was no longer supported. Still, it’s probably worth downloading and comparing. Write code snippets today and you can roll them into more robust code generation templates later. Goal: get to the point where you click one button and the code for your whole app is written for you automatically. Reality: Most business problems are more complex than just performing CRUD operations on a single table at a time, and I haven’t found a solution that can autogenerate such complex logic. In the mean time, I’m finding the Code Snippets feature in VS 2005 to be a step in the right direction. The best part is that there is little to no effort lost in creating snippets as you go. If you later decide to go with a template-based code generator like CodeSmith. When that time comes, you can use a little regEx magic to roll up those snippets into more robust templates.